For incoming calls MiCloud provides Call Centre, Attendant and Hunt Group functionality, allowing a group of users to be addressed by a single number, where both fixed, mobile and VoIP phones can be included. For Hunt Groups, both sequential and parallel ringing is supported. For Call Centre groups, skills-based routing, automatic agent logout, manager assistance, presence-based call distribution and agent resting time is supported with queues that have group specific greetings and progress messages. In addition, ACD agents have a dedicated soft button to call for manager assistance. Each user may be logged in, via web pages, PC, Mac or mobile applications, to multiple groups simultaneously and the system may be configured with policies of how to distribute calls to Desktop, Mobile or Desk Phones on a per group and user basis. MiCloud includes management tools for call center groups to allow a supervisor to efficiently monitor and manage group queues and agents statistics. Automatic call distribution group HTML widgets are provided for incorporating statistical dashboards into portals and business applications. 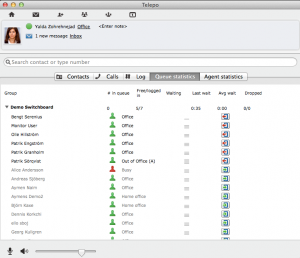 The ACD agent view sits on top of the desktop, splitting it so that the ACD agent view with the call information is always visible even if other applications run in “maximized” mode. For Attendants and ACD agents, auto answer and configurable keyboard shortcuts exist for efficient call handling and to avoid mouse movements. ACD licensing is based on a floatation license basis, meaning that one license is consumed when an agent logs into one or more ACD groups and released when the agent is no longer logged into any ACD group. ACD and Attendant supervisors have a management tool for ACD and attendant groups that allow a supervisor to efficiently monitor group queues and manage agents. The management tool presents statuses of agents and queues, while providing the supervisors with the necessary information to log agents in and out to fit the current needs of each group. A Supervisor agent can be added to monitor the attendants and log in/out agents from queues to manage the load in the Call Centre. Supervisors also have reports and statistics on queue or agent level.